From the moment it became clear that the mass killings at Berlin's Breitscheidplatz Christmas market on Monday were the actions of a Muslim terrorist, accusing fingers have pointed at German Chancellor Angela Merkel. And not without good reason. Beyond Merkel's "open door" to Syrian refugees has been the government's general sloppiness when it comes to counter-terrorism. Throughout the European Union, guilt about the Holocaust has colored government approaches to Muslim immigrants since the rush of guest workers arrived in the 1970s. Concern about "tolerance" and religious rights have repeatedly led to oversensitivity among lawmakers and to a tendency for Europe's leaders and many of its people to simply look away. Honor violence was ignored for decades until former Dutch Parliamentarian Ayaan Hirsi Ali forced it into the limelight in the years just after 9/11. So were anti-Western sermons given by Arab-funded imams in Europe's mosques. But nowhere, rightfully, has the guilt been quite as heavy on a country's soul as it has been in Germany. Which may explain what the Wall Street Journal describes as "a cascade of mishaps before and since the [Christmas market] attack" that "suggest Germany isn't geared up for countering the terrorist threat." 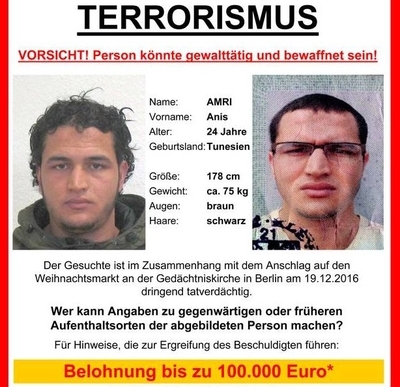 Everything that needed to be known about Anis Amri, the Tunisian-born suspect in the attack was known well before he plowed his truck into the outdoor festivities on Dec. 19, killing 12 people and injuring 48. Authorities watched him for months, though the Daily Beast reports he "managed to slip off their radar" sometime around September. He served time in Italy for arson. He had a history of drug trafficking. He had been convicted in absentia of robbery in his home country of Tunisia. He had known connections to an extremist imam. Germany even rejected his asylum claim, though he managed to escape deportation. Then there was the target of his attack. The U.S. State Department issued a travel alert for Europe last month, warning of possible terrorist attacks at "holiday festival, events, and outdoor markets." And a child is suspected of attempting to bomb another German Christmas market two weeks prior to the Berlin attack. Yet no barriers were erected to protect the market. There appear to have been no checkpoints, and no heightened security at the event. This isn't just a "cascade of mishaps." Much of Germany's failure to quash Muslim youth radicalization and to defend against terrorist attacks comes from its approach to national security and surveillance. Post-Holocaust Germany has placed tight restrictions on intelligence-gathering, particularly when it comes to privacy concerns. "Skepticism towards surveillance runs deep in Germany because of the excesses of the Nazi Gestapo and East German Stasi secret police," Reuters reports. In addition, a Law Library of Congress analysis notes that, "intelligence agencies are not authorized to use force or other types of police powers to gather information." And yet, says Reuters, "Intelligence agencies say there are signs that Islamic State may have planted fighters among the hundreds of thousands of migrants who arrived in the country in uncontrolled fashion last year." Germany's past also shapes its migrant policy today. Merkel and her supporters point to the fact that many Germans were migrants after the war, and they speak of the lessons learned during the Shoah. "All Germans know the history of the murderous race mania of the Nazis that led to the break with civilization that was the Holocaust," Merkel's spokesman Steffen Seibert said last year. "This is taught in German schools for good reason, it must never be forgotten. .... We know that responsibility for this crime against humanity is German and very much our own." Opening the doors to religious minorities escaping war and autocracy is a form of repentance. So, too, is a hands-off approach to religious figures who preach violent or misogynistic doctrines that violate our own. Such approaches may ease German consciences, but they too often go awry. What, after all, are jihadist attacks like the one at the Breitscheidplatz market if not "crimes against humanity"? Germany is right not to forget its past. But in trying to set it right, the country has just gone tragically very wrong.